Truly magical! A new Christmas classic... Scrumptious old-fashioned buttery shortbread kissed with sunny orange zest, a modest amount of finely chopped pecans and a whisper of spices topped with spiced deep-red holiday Sugar Plum Jam. 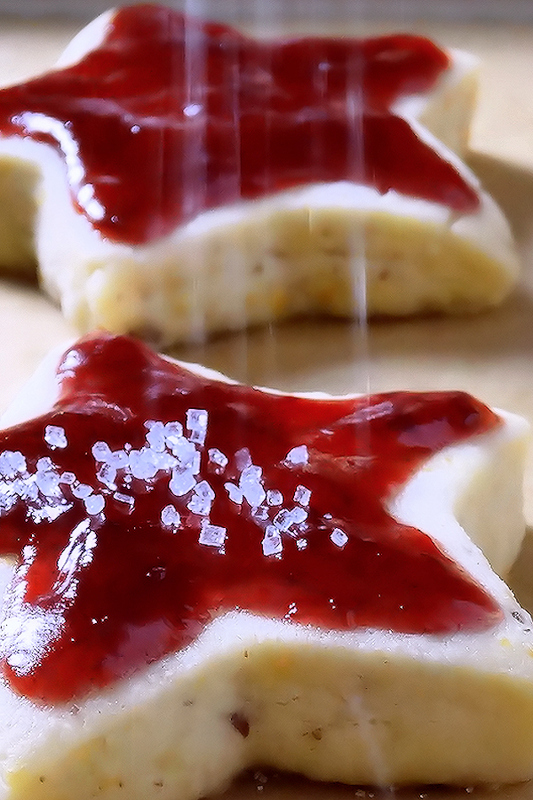 Our Sugar Plum Shortbread Christmas Cookies are like a jam-topped English scone turned into a shortbread cookie! Perfect for Christmas brunch or dessert. Everyone will love them! Arrange oven rack in lower third of oven and preheat oven to 325ºF (about 165ºC). Line two baking sheets with parchment paper; set aside. Alternatively, lightly grease two baking sheets before using. In a medium bowl, combine flour, spices, nuts, sugar and orange zest. Using a pastry blender, or heavy-duty stand mixer with paddle attached on low speed, cut in butter until mixture resembles fine crumbs and starts to cling together. Dough will still be very crumbly. Knead the dough until smooth. Form into a ball and then flatten slightly into a compact disk. On a lightly floured work surface, roll dough until ½-inch thick. Using 1½ to 3-inch size cookie cutters, cut into desired shapes. Place on prepared baking sheets 2 inches apart. Bake for 18 to 22 minutes (18 to 20 minutes for small cookies or 20 to 22 minutes for large cookies) or until bottoms start to brown and centers are set. Allow cookies to cool slightly on baking sheets for 2 minutes. Using a metal cookie spatula, transfer cookies to wire racks to cool completely before icing with jam and sprinkling with sugars.